Tell Me What You Really Think…Please! Chakras are wheels of energy where we receive, assimilate and distribute life energies. Through external situations (pressures of life) or internal habits such as poor physical alignment or self-destructiveness, a chakra can become imbalanced. The simplest way to balance each chakra is to create alignment in the physical body. Your body reflects your imbalances, acting as a mirror through which you can gauge how each chakra is functioning. Your physical practice is he first steps toward aligning your body and balancing each chakra. Instead of trying to change the way the mind works and overcoming years of patterns and beliefs, Joga postures work to realign the physical energy centers that govern specific behaviors. The throat chakra (Visshuda Chakra) is located in the neck above your collarbone. This is the chakra of communication; how we speak, the words we choose, the tone, the truth and the lies. It is in the throat chakra where we repress our emotions and anger, which consequently manifest in throat problems, such as sore throat, laryngitis, mouth sores, speech impediments and TMJ. It’s our domain of wisdom and communication from a higher mind. We have all had a ‘lump in our throat’ before and have felt that desire to speak but hold back for lack of exploiting ourselves or offending others. An indication if the throat chakra being over-active are symptoms of excessive lying, a person who talks to much, the inability to listen and receive someone else’s thoughts. We all know a few ‘chatter boxes’ in our life- and although it seems like they have a lot to say, in reality they are hiding some truths and are avoiding personal matters. So the next time you have some one ‘in your face’ instead of reacting harshly and feeling annoyed, understand they are just over compensating for pain of some degree – tap into your compassion and just listen, eventually they will stop talking! The complete opposite is someone who is as quiet as a mouse and feels like they should not be heard, nor deserve to be heard; an underactive throat chakra. Physically they will look closed off to the world: shoulders will round forward, heart will be sunken in and throat will be hidden because the eyes are always looking down. The easiest way to encourage some one with low throat chakra energy to ‘open up’ is to physically start to open the chest, shoulders and throat. Something as simple as interlacing fingers behind the back and lifting chest and chin towards the ceiling can start to release this stuck energy. 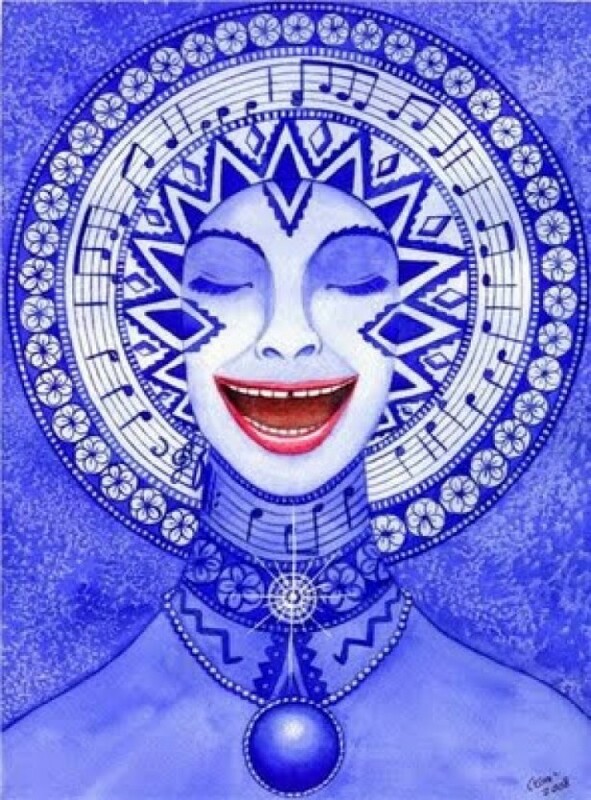 Things like humming and singing are also great for those who have an under-active throat chakra. • Do others see me as aggressive or overbearing? • Do I dominate conversations? • Do I find it hard to speak up for myself? • Do I lack inspiration? • Do I feel connected to my spirituality? When Vissudha chakra is balanced, you discover your true voice and can be yourself in all situations. Your communication is clear and untainted and you come to others with kindness and compassion. You have the space to see yourself clearly and can let the divine wisdom of the universe guide each moment of your life.